Meet DublDom 120, one of architect Ivan Ovchinnikov’s modular prefabricated designs. With a cost under $40,000, the design for this rural getaway in Russia is based upon simple technology and inexpensive materials, allowing the residents to benefit from an affordable price tag and short construction timeline. At the same time, the architect emphasizes a thoughtful approach to high quality architecture, with due consideration for the ecological and visual environment of the surrounding forest. 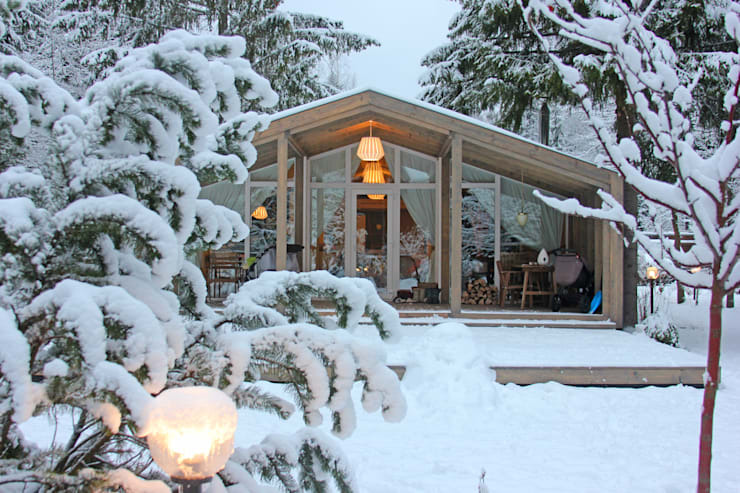 Taking on elements from a traditional mountain chalet and blending them with simple Scandinavian design, this country cabin offers up a heartwarming character and down-to-Earth aesthetic making it easy for the whole family to play, adventure, and relax. Prefer French? Lire cet article en Francais. The home offers several different points where the family can access the home from their yard. The front door is reached by following a trail of friendly glowing orbs, leading to an elongated front porch. This initial threshold offers sheltered space along its entirety, the feeling of security enhanced by the warmth of the beige walls and ceiling that distinguish the front entrance area. 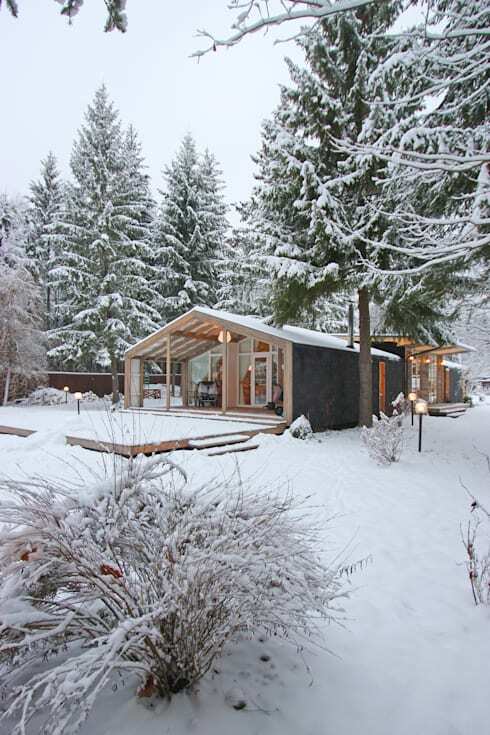 The home sits tucked away behind the shrubs and trees, a feat made possible by the fact that the building arrived in prefabricated modules. With most of the home pre-manufactured, the builders were able to leave the natural features of the site relatively undisturbed. 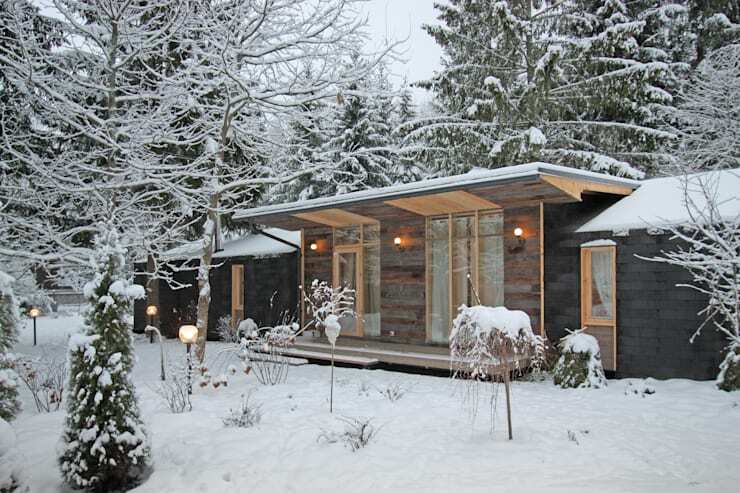 The side of the home offers a characteristic chalet-like profile, an appropriate design for its snowy pine forest location. The side facade has been designed to open up to a large wooden deck, with the walls made completely from glazed windows. From this angle, the photograph demonstrates how well this building blends in with its environment, its windows reflecting the snowy branches while the neutral wooden frame exercises a low-impact visual effect. A brand new cast-iron stove poses as an old-fashioned model, bringing the home back to simpler times. 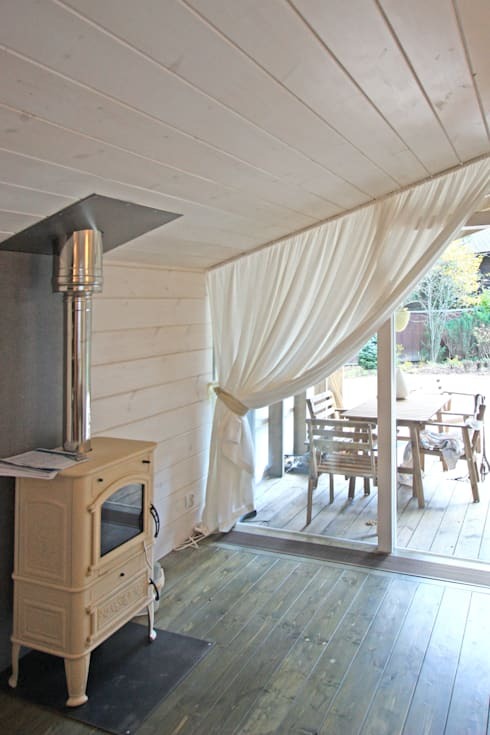 Given the home’s location in a pine forest, heating the home with wood is a smart solution allowing the family to spend less on utilities through the winter! 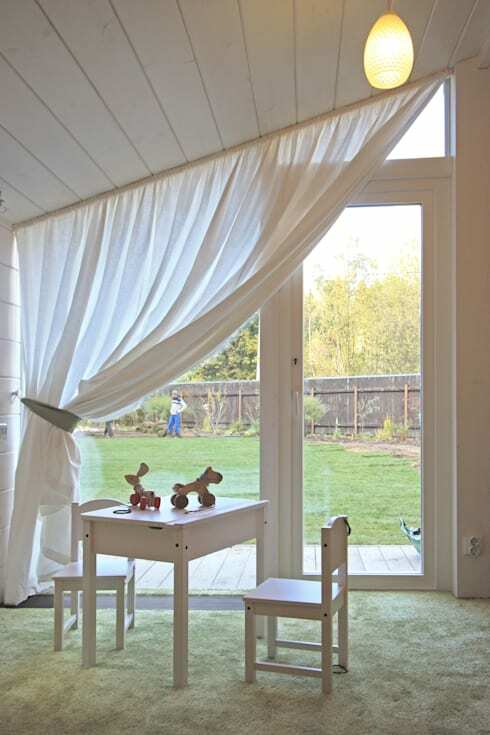 Designed with family in mind, the home also offers a children’s area, with miniature furniture painted in white – but the real attraction is the big backyard! In summer and winter both, this home offers a refreshingly simple and laid-back escape for all members of the family. 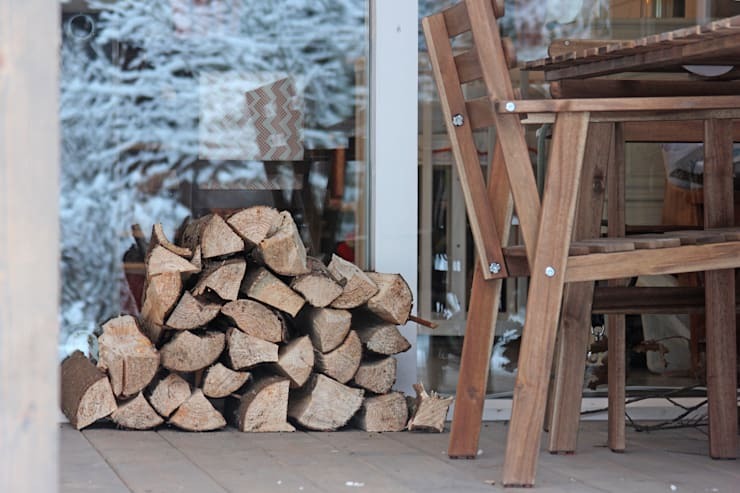 A stack of wood sits on the porch, ready for use in the home’s old fashioned stove. Nearby, a picnic table invites you to sit for a while, enjoying the scenery and fresh air. All around, simple designs and natural materials bring an effortless, casual feeling to this country home – and it was all achieved in a matter of days, as the DublDoma was manufactured with the interior trim, fixtures, and electrical equipment already installed, significantly cutting on-site construction time. With minimal disruption to the environment, an affordable cost, and quick construction, this prefabricated home is a win for everyone involved. 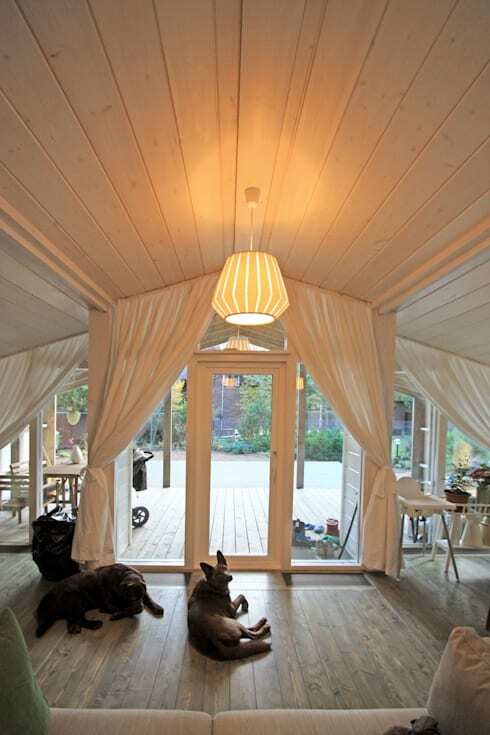 Share your comments on this prefabricated home design below!